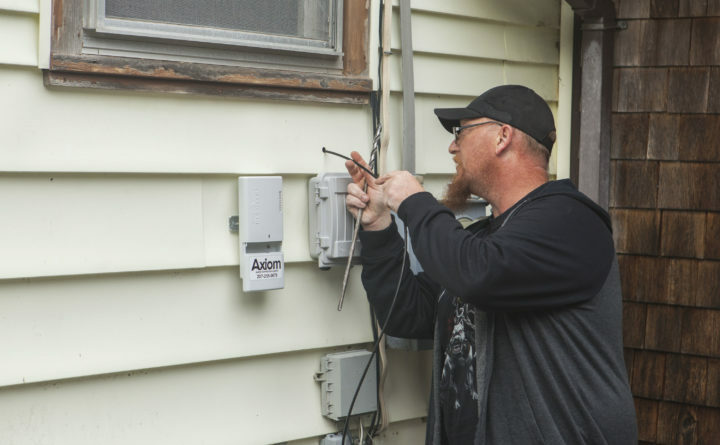 An Axiom Technologies technician installs the first fiber at an Islesford home. A recent $1.2 million investment in broadband technology brought high-speed access to to Cranberry Isles. 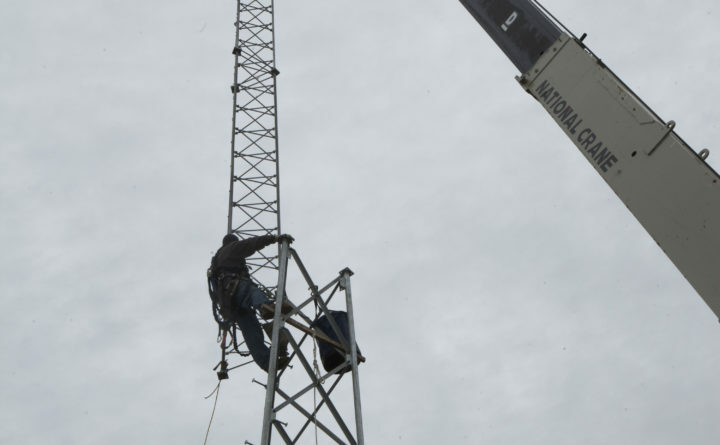 A broadband tower installation on Islesford, which will link broadband infrastructure between Great and Little Cranberry Islands after a recent $1.2 million investment. About 120 year-round residents of a cluster of isolated Maine islands recently decided to spend a lot of money upgrading their internet, and now the U.S. Department of Agriculture says it will cover the bill. Last week, the USDA awarded the Cranberry Isles, a cluster of five islands near Mount Desert Island accessible only by boat, a $1.3 million grant toward broadband connection improvements. Residents of the Cranberry Isles voted last spring to borrow $1.2 million to bring a high-speed fiber-wireless network to three islands, only two of which are inhabited year-round. That effort will no longer need to be funded through local taxes. Before launching the broadband push, the islands were on the brink of losing internet service, according to Malcolm Fernald, a town selectman. The property that housed the equipment that provided what existing internet connections the islands had was going up for sale, and the owner wanted to get rid of the gear to make the property more attractive. Residents first contemplated renewing the existing service but knew it would still have the problems that prompted regular complaints — slow speeds and lack of reliability — so they explored other options. “To get grant money, you have to get broadband speeds and a solution that will last decades,” Fernald said Monday during a panel session intended to celebrate the activation of the Cranberry Isles’ new internet. The Island Institute, a nonprofit that works to support island communities with development projects, announced the grant during Monday evening’s panel session in Belfast. The panel was part of a conference highlighting efforts to spread broadband service along Maine’s rural coast and islands, but it took on a new tenor with the news of the USDA grant. “People saw this as essential to sustain the community,” Town Administrator Jim Fortune said of the broadband push, which he said would help ensure that people didn’t have to move away or commute to the mainland to make a living or accomplish tasks that would be a few clicks away with a reliable connection. The Island Institute said some artists on Cranberry Isles had to take the ferry to the mainland to upload images of their art so they could advertise it online. Students at the high school had to stay at school to do their homework because the internet at home was inadequate, if it existed at all. Others had to huddle around the library, to find a strong enough connection. The first Cranberry Isles homes have already been hooked up for service, and most other homes that sign up should be online this summer.